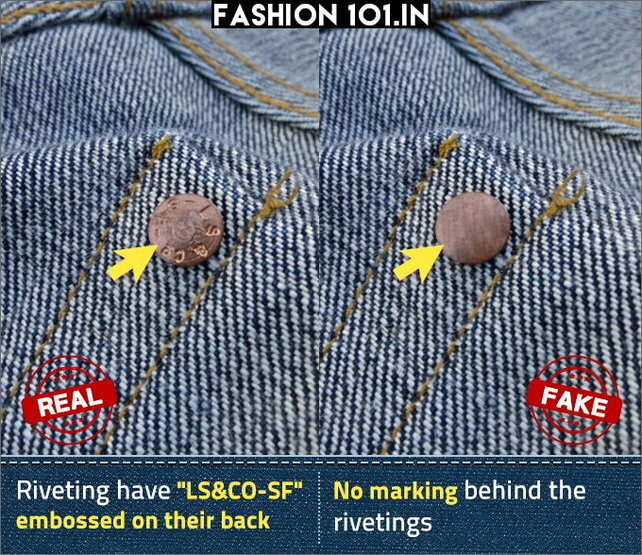 How to spot fake Levi's jeans | iSpotFake. Do you? 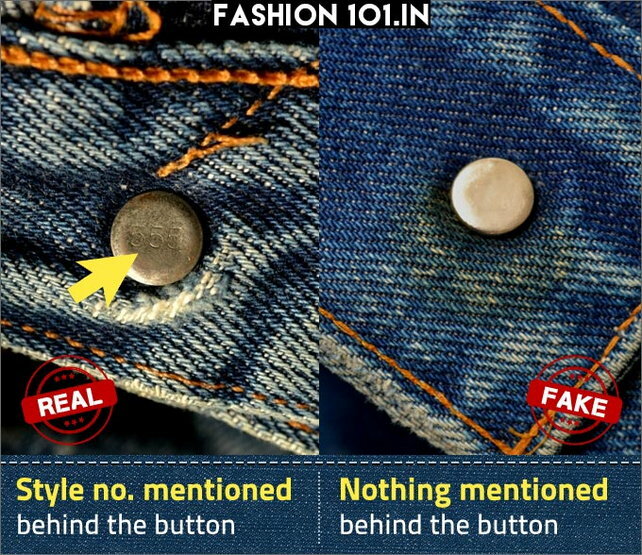 While the quality of the denim is the main parameter, one thing that the fakers have failed to copy is this small detailing. An original pair will have the style number embossed on the back of the button. For the classic 501 style (which is more than 125 years old now), the same numbers will be embossed on the back. For other styles, there will be a letter and a couple of numeric digits. In fake Levi’s this small detail is often ignored. The rear double-horse patch is the real insignia of the Levi’s pair. While the copies have managed to fake them too, they still haven’t been able to figure out the original material. If the rear patch is a hard leather-like material, the jeans could well be fake. The real product will have a softer leather-like texture. Also, the imprint is slightly worn out. In order to compensate for the fakeness, the cheap copies usually darken the two horses. If the rear seems suspect, this isn’t the real deal.  All real jeans from the brand have consistent marking patterns. 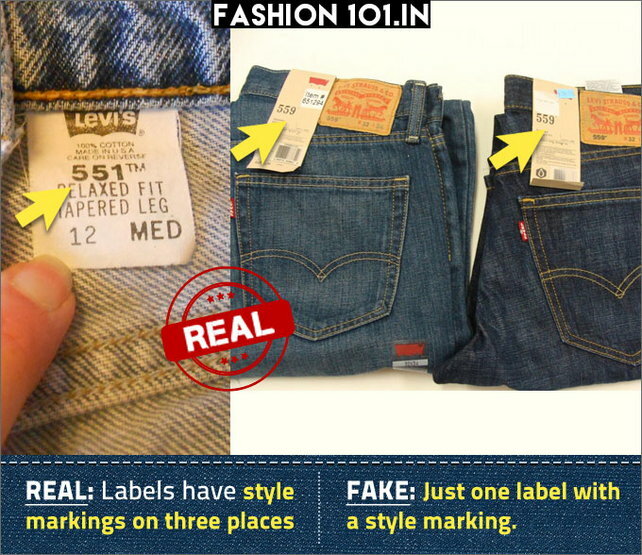 If you notice a tag on the jeans, they will have a certain number written on them. The number is usually 501 or 511 followed by a series of 5-7 digits. The 501 or 511 marking identify the style and cut of the jeans while the other numbers represent several other details. These digits must be the same in three places. Apart from the tag, these numbers should also be on the rear patch and a small tag on the inside of the jeans. 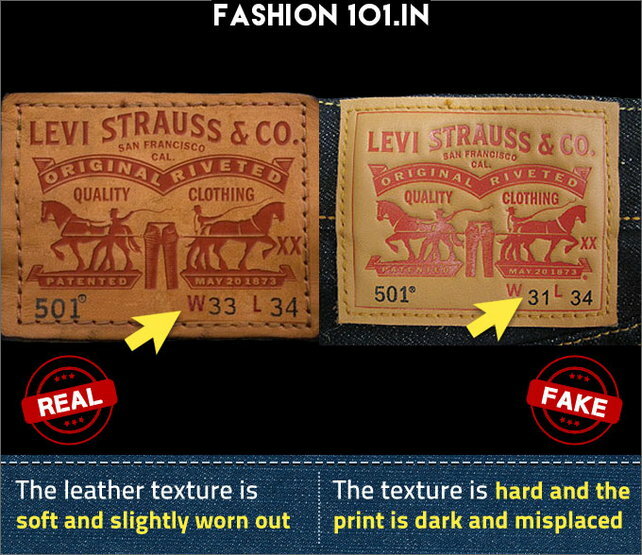 Unless these numbers match, be assured that the jeans you are buying are fake. The original Levi’s pair are known for their shiny and smart riveting on the pockets (this is why it’s there). Fakes have managed to copy that perfectly well and it is hard to differentiate a fake from a genuine one. Having said that, the real ones have inscription on the back of the riveting. Every genuine pair has the letter LFSF embossed on the back. The letters are short for Levi’s Strauss San Francisco and are present across all original products. Do check these to ensure that the pair is original. The red tab on the pocket is another famous insignia of Levi’s. The company writes “®” (Registered symbol) on every 100th pair they create. So if one of your pair has it and the other doesn’t, you don’t have to necessarily freak out. 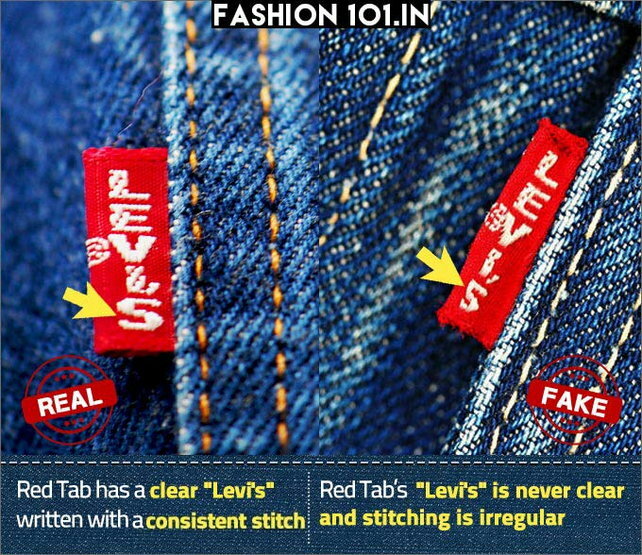 When you do notice the tab, ensure that the word ‘LEVI’S’ is written on it in white. The registered symbol will be on the left and not on the right. You must also observe the stitch around it. 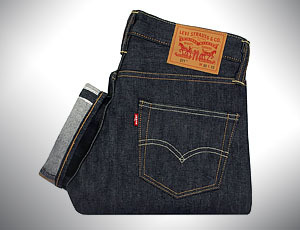 Original Levi’s products have a seamless and straight stitching around the pocket. In the fakes, the stitching is irregular.